Join us on Friday, January 6, at 7pm ET for a freewheelin' discussion on Rogue One, Fantastic Beasts and Where to Find Them – and probably a lot of other Star Wars and Harry Potter stuff! 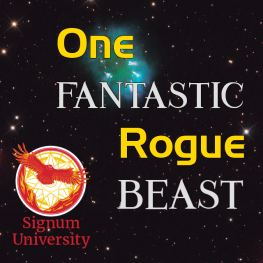 Perhaps you, like many here at Signum, managed to sneak off at some point during the holidays and watch Star Wars: Rogue One or Fantastic Beasts and Where to Find Them, and emerged full to the brim with observations and questions about the filmic and textual ramifications of the productions. And perhaps you, like many, attempted to engage those around you in deep conversation along these lines and found yourself the unwitting recipient of sidelong glances or conversational partners edging discreetly out of the room. Well, fear not: We, too, would like to talk at length on just such topics! In fact, we’ve prepared a special Signum Symposium for this very purpose. On Friday, January 6th, at 7 PM ET, Professor Sørina Higgins will be hosting a roundtable discussion with three Signumites: Katherine Sas, Brenton Dickieson, Kelly Orazi, Curtis Weyant, and Emily Strand. The group will discuss the two recent films and touch on wider Harry Potter and Star Wars-related questions while they’re at it. Brenton Dickieson is working on a PhD on the theology of C.S. Lewis’ fictional worlds and writes the blog, www.aPilgrimInNarnia.com. He lives in the almost fictional land of Prince Edward Island, where he teaches and consults in higher education. Kat Sas recently submitted her final M.A. Thesis for Signum University where she is completing her degree concentrating in Imaginative Literature. She knows a lot more about Harry Potter than about Star Wars, but she looks forward to discussing both movies with her fellow Mythgardians. Curtis Weyant was born in The Year of the Force, making him a Chosen One of some kind – though of what type, exactly, remains to be seen. He read most of the Star Wars Legends stories before they were Legends, and he is happy enough people have finally seen Rogue One that he can talk about it without having to avoid spoilers. Kelly Orazi is a longtime bookseller, reader, and Signum student. She spends her days reading Harry Potter, pretending she has the Force, and hanging out with her dog, Lupin. She is descended from a real-life wandmaker, but has yet to embark on the journey of making her own lightsaber. Emily Strand is a professor of Comparative Religions at Mt. Carmel College of Nursing in Columbus, OH, where she also serves the Catholic diocese as a a Master Catechist. Besides her books on liturgy, she has published articles on the Harry Potter series, including a contribution to Harry Potter for Nerds 2, is a staff writer at HogwartsProfessor.com, and has appeared on the Mugglenet Academia podcast. Strand blames Amy H. Sturgis’ Star Wars course for her full-on obsession with all things Jedi.